Utah is, so far, my favorite state to stare at. Waking up to orange-red rocks against the sky is like opening a present. 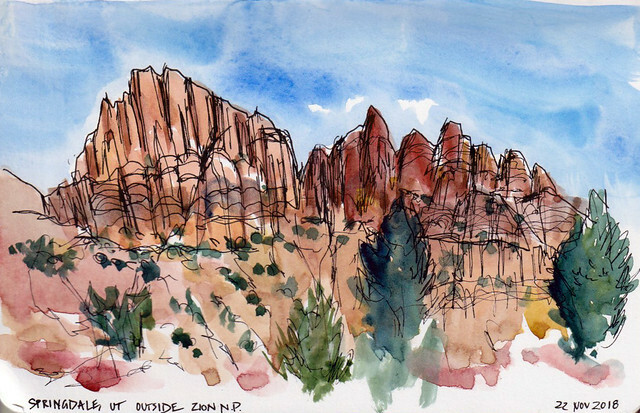 I was in love when we visited Arches and Moab three years ago, and I couldn't wait to go back. Sure, I would choose ocean over mountains all day long, but when the mountains are rusty monoliths and creamsicle spires and golden slot canyons ... let's just say it's easy to forget the allure of crashing waves for a few days. Over the long Thanksgiving weekend, we went to Zion and Bryce Canyon National Parks as well as Grand Staircase-Escalante National Monument. 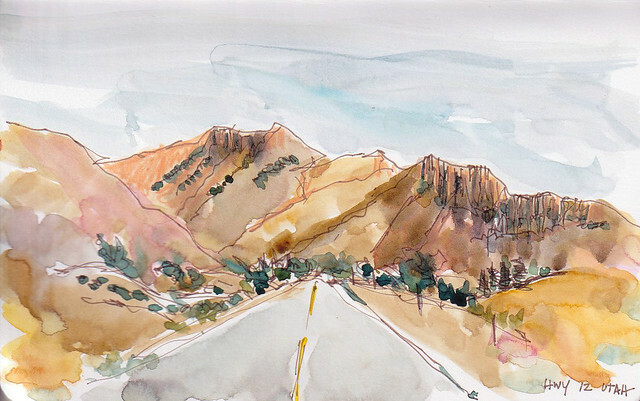 We started our trip in Springdale, Utah, just outside Zion National Park. Our first day in the park was chilly and rainy, but we still managed to do a bit of the Riverside Walk (though not the Narrows as we'd planned), Weeping Rock, and the Lower Emerald Pool trail before retreating to our hotel for a nap. Friday, however, brought better weather. We got an early start for our hike up the trail to Scout's Lookout. 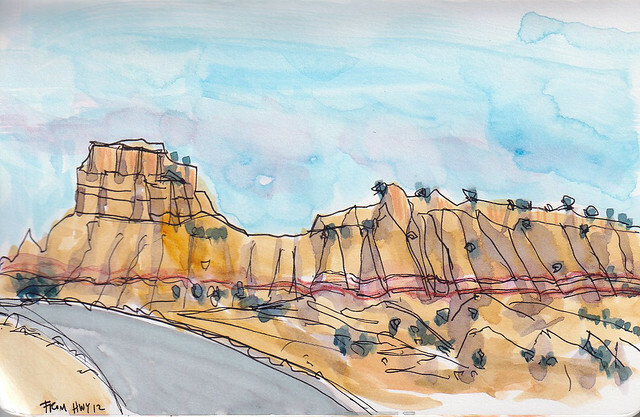 M. went up there but I stopped in the middle of Walter's Wiggles (a series of switchbacks) to sketch the valley below. After lunch we headed to Bryce Canyon, where we saw the sun slowly sink over the snow-dusted hoodoos. 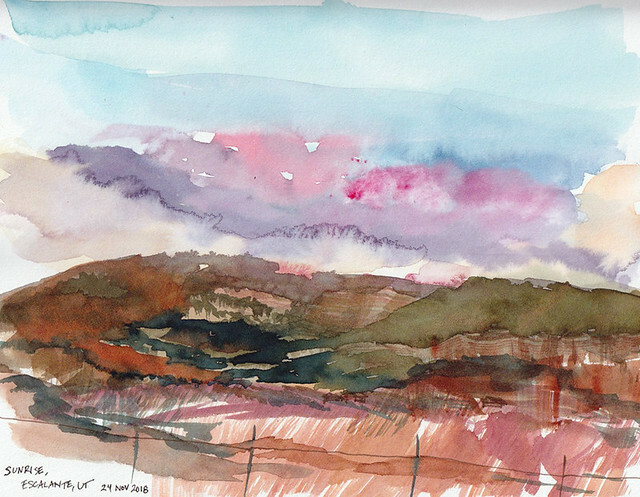 Our destination that evening was Escalante; I did a quick watercolor of the view outside our hotel room window the next morning as the sun rapidly rose. Following a long drive on an unpaved road and a rather taxing rock scramble, we arrived at Dry Fork slot canyon, one of several at Grand Staircase. It was quite an experience to wander through it as the walls narrowed and opened up by turns. In the afternoon we backtracked on Route 12 on our way to Cedar City. 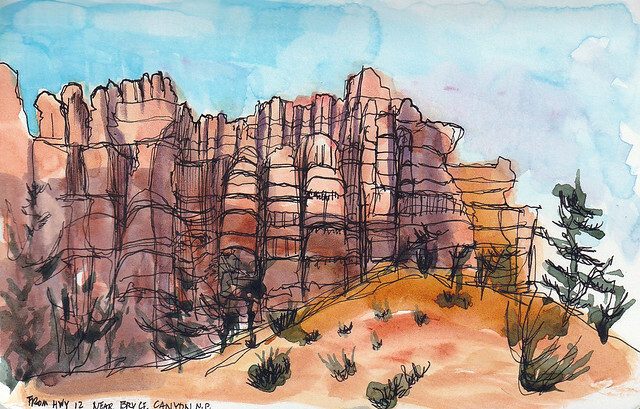 I sketched the area near Bryce Canyon this time, and did some quick captures of the otherworldly formations all around us on the highway. I was sad to leave Utah on Sunday (though I will admit that our relaxing afternoon at Canyon Ranch Spa at the Palazzo in Vegas was the perfect chaser to all that hiking). On our next visit, I'd love to bring my easel and oils and spend more time painting the breathtaking landscapes in this state. 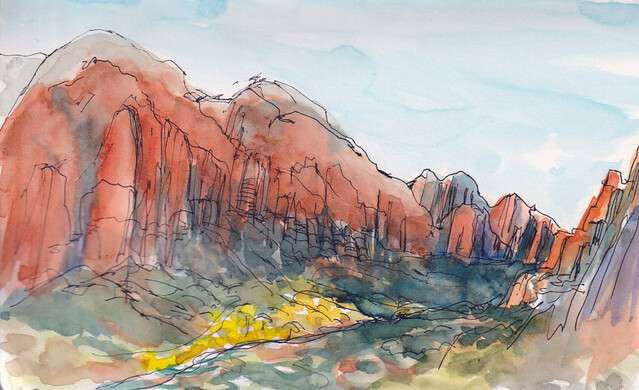 Love the sketches of the rocks and the valley. Those parks are so amazing! Nicely done! !